handed over your confection scissors. Our city inhabitant Lut De Cremer returned from a trip to Burundi. As announced earlier she started op a sewing workshop in Mabayi. With funds of the association 'Vleugels van Hoop' vzw what means “Wings of Hope” young people will get a training there. A few extracts from Lut’s dairy. On January 12th we traveled with a group of 12 to Rwanda. Everything went fairly smooth and 3 days later we arrived, by jeeps, in Mabayi – Burundi. 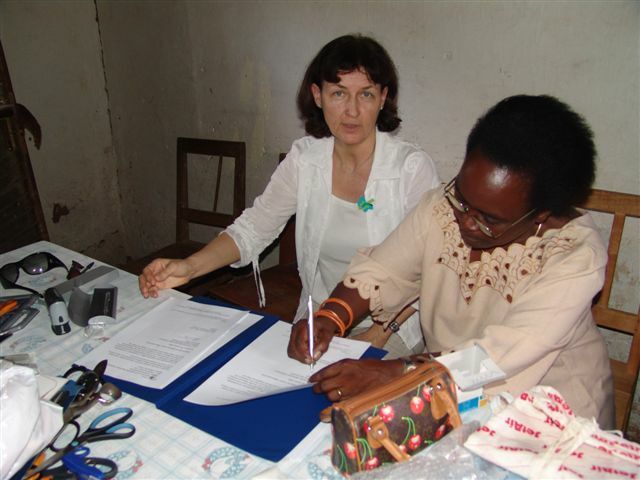 The next morning we were expected, around the clock of 10, in the small work shop for undersigning of the cooperation agreement between “Dushigikire Amahoro i Burundi”, meaning “cooperate for peace in Burundi”, and “Wings of Hope” vzw. In the middle of the full activity of a African market day and by the agitation of seeing that entire group of white people, we arrived only around 10.30 on the appointment. The walk from our boardinghouse to the village was one with lots of noise and amazement. The small local school didn’t know how to respond on the exuberant response of the children and therefore allowed the students to leave school to accompany us to the rural centre. In a flow of all those curly children we just drifted along. In the small workshop the cutting table was used as meeting table and the cooperation agreements were spread out in the presence of all members and interested people. After the presentation of the two parties Ms Josephine Bararwendera, president of DAB, read the French cooperation agreement and translated this to Kirundi, because a part of the members were not used to use French (or English) language. The undersigning itself, by both presidents, Mrs Josephine Bararwendera for DAB and Mrs Bernadette Verhoye for “Wings of Hope” vzw was sealed with a joy song by the Burundi members. Then the hand over of the presents by the visitors started. Dozens of confection - and other scissors, gifts collected as a result of an article in the newspaper “Nieuwsblad/Het Volk” of December 7th 2007, reels with yarn, press - and ordinary buttons, marking red ochre and other tools to extend the workshop were offered. The enthusiasm is bigger than we could imagine and soon pen and paper popped up to make the first inventory. 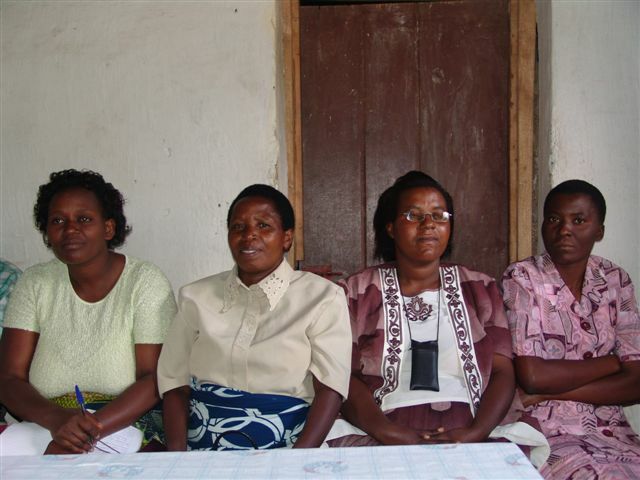 As the Burundese president expressed, since the announcement in the village that a sewing workshop would be sponsored, several women made an application to join. The direct contact within this project offers more solidarity with the complete happening. The hundreds of “Murakoze” (thank you) and “Amahoro” (peace) were shared reciprocally, also after we were accompanied to the local market after the official part in the workshop. Around noon we left, accompanied by Josephine and her spouse, Léandre, to the Rwandan border to spend the night in the three country spot (Congo-Rwanda-Burundi) Cyangugu. At that border we said farewell to our friends and we are convinced that our cooperation will work in a very positive way.